Do rapid temperature changes in shallow groundwater indicate rapid recharge? Do fluctuations in this shallow aquifer influence deeper aquifers? At what point does localized precipitation result in a rise in the potentiometric surface of the shallow aquifer? What is the benefit of monitoring shallow groundwater fluctuations with respect to the regional groundwater situation? Is real-time monitoring of shallow groundwater worth the cost? On March 27, 2010, the water level data logger in MW-2 was changed out and replaced with a data logger that records water level and water temperature. Data is recorded hourly. Since its installation, groundwater temperature has risen from 16.63 degrees Celsius (C) to 22.6 degrees C. During the water year ending September 30, 2010, 93+ inches of precipitation were recorded at this location. Base water level is in the 5.18 to 5.22 foot range as seen in the relatively dry period from June 6 to August 15, 2010. During this dry period, area lawns turned brown and crunchy indicative of the dry condition. Beginning August 30, 2010, abnormally dry conditions returned to the area. Area stream flow data also show the effects of the lack of precipitation and these dry times have been reported in the press. The new graph, see below, will be updated periodically. 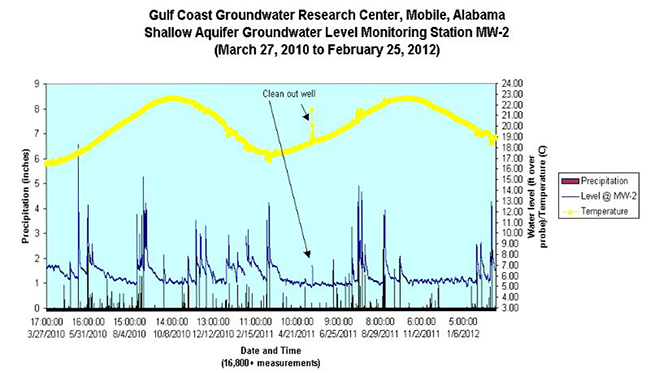 Since 1994, groundwater level data has been monitored in shallow wells at OAI's "Gulf Coast Groundwater Research Center". The wells are completed in a shallow alluvial aquifer adjacent to Eslava Creek in Mobile, Alabama (USA). The water level in the wells is influenced by precipitation events and the stage of Eslava Creek. Over the years, both periodic and detailed water level measurements were collected with the data analyzed. The periodic data was recorded at various time frequencies for specific events such as hurricanes or as a logger was available. 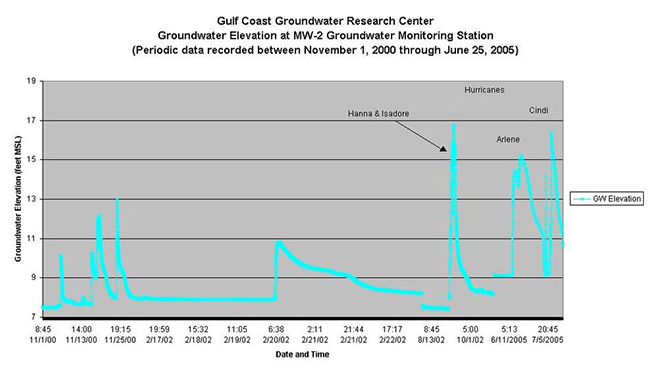 The first chart, see below, is a composite chart showing the groundwater elevation recorded periodically in MW-2 between November 2000 and June 2005. As in the past, tropical storm data will be watched closely and added as soon as practical. From Hurricane Katrina in August 2005 to September 2007, southwest Alabama was been drier than normal. On April 1, 2007, a data logger was installed to continuously record water level in OAI's MW-2. The water level is recorded at various intervals*. In addition, precipitation received on site is recorded and plotted. The data from this effort, see below, shows a recurring, typical and predictable pattern of rising and falling of groundwater elevation in response to precipitation events on-site and, in some cases, from precipitation in Eslava Creek's watershed but away from the project site. The effect of the rise and fall of the potentiometric surface on direction of groundwater flow must be considered when evaluating groundwater flow patterns at this site (and others subject to temporal variations in groundwater levels) before remedial measures are planned and implemented. A 1995 study completed by Daniel J. O'Donnell at this site found groundwater flow direction shifts 180 degrees from the "normal" or "expected" flow direction after significant precipitation events. The resumption of a "normal" flow pattern took about two weeks. On March 27 and 28, 2009, a total of 9.3 inches of rain fell (7.10 inches on the 28th) resulting in a rise in water level to a groundwater elevation of 16.96 feet, the highest level recorded over the two year period monitored. *2-hour intervals April 1- May 13, 2007; 4-hour intervals May 13 - July 29, 2007; 1-hour intervals July 29, 2007 to ending date posted above.